Biospresso capsules compatible Nespresso ® Peru Palomar bio of the brand Destination Premium. This 100% Arabica coffee from organic farming is both greedy and tart. Organic compatible capsules freshly roasted in an artisanal way in France. 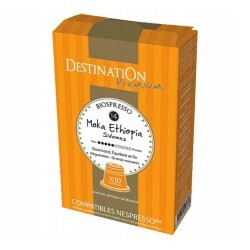 Enjoy this organic coffee pack from the Destination brand to enjoy real organic coffee in your Nespresso ® coffee machine.This pack consists of 70 capsules that cost you will not surprise its quality. 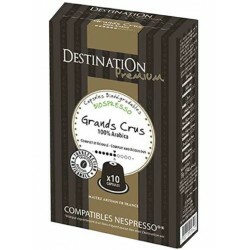 Biospresso capsules compatible Nespresso ® Grands Crus organic brand Destination Premium. This 100% Arabica coffee comes from organic farming and is cultivated above 1000m altitude. Organic compatible capsules freshly roasted in an artisanal way in France. Biospresso capsules compatible Nespresso ® Brazil bio of the brand Destination. This coffee of origin of Brazil is 100% Arabica resulting from organic farming. Compatible capsules of soft coffee, freshly roasted in a traditional way in France.